Sylvie Weil grew up in France and earned degrees in classics and French literature from the Sorbonne in Paris. She has taught in several universities, first in France, then in the United States. Ms. Weil encountered Rashi, the eminent commentator on the Bible and the Talmud, while studying the Bible in Hebrew. His commentaries revealed what a generous, down-to-earth man he was, and she wrote a book about him for adults. But when it was finished, she couldn't bear to leave him behind. So she wrote a novel about his family from the point of view of his real-life granddaughter, Elvina. Ms. Weil makes her home in both Paris and New York City. 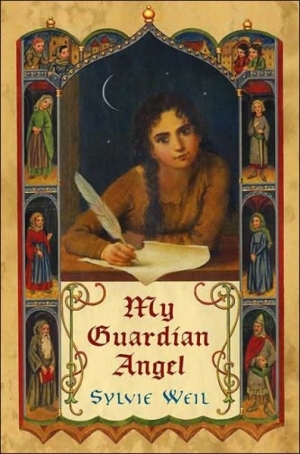 In this sequel to My Guardian Angel, Sylvie Weil continues the story of Elvina, the 14-year-old granddaughter of Rashi, the famous 11th-century French Bible and Talmud commentator. It is the spring of 1097 in the town of Troyes, in France. The Crusaders have been marauding their way through Europe, attacking Jewish communities. One evening, a mysterious family arrives in Troyes—German Jews forced by the Crusaders to submit to baptism. The townspeople shun the family, but Elvina befriends 11-year-old Columba. Columba’s mad cousin, Ephraim, steals a mirror from a member of the Jewish community, believing it will let him see his family killed in the recent attacks. Elvina tries to help Ephraim rid his mind of the terrible images by bringing him her own mirror, in which she claims to see a positive future. 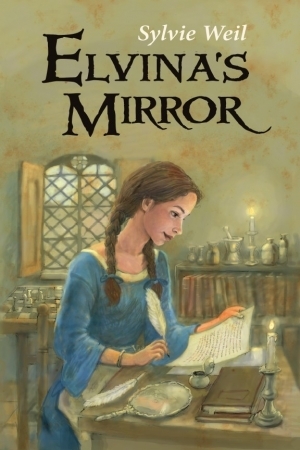 With a varied cast of characters and an action-packed plot, Elvina’s Mirror will keep the young reader’s interest from beginning to end. The streets are eerily empty, and everyone in the Jewish community is terrified of Peter the Hermit. His men, the Crusaders, are moving through the town on their way to the Holy Land. The have been known to batter down doors and burn Jewish houses, all in the name of religion. This is no Nazi Germany, but Troyes, France, in 1096, as seen through the eyes of funny, feisty, twelve-year-old Elvina. She is the granddaughter of the great rabbi, Rashi, and she knows how to read and write--which is very rare for a girl of her time. She draws strength from this, as well as from her Guardian Angel, to whom she speaks constantly. On a cold Sabbath afternoon while Elvina is alone in the house, three soldiers pound at her door. One of them is wounded. Elvina has only a moment to make a difficult choice that could put her family and the entire community at risk.Can her guardian angel guide her and keep her safe? Winner of the Prix Sorcieres, France's most prestigious award for children's literature, My Guardian Angel is a story of compassion and tolerance that speaks clearly to readers of all faiths. Elvina's voice lingers long in the memory, and her courage and humor long in the heart. An enlightening lesson about anti-Semitism in a time period long before the Holocaust. An intriguing take on the experience of being Jewish in Europe in 1096. Readers don't have to be Jewish to appreciate this beautifully written story and its wonderfully realized characters and fascinating setting. Lovely.